Preheat the oven to 350º. Toss the tomatoes into a bowl and drizzle 1/4 cup olive oil over and sprinkle them with salt, gently toss. Spread the tomatoes out on a lightly oiled baking sheet and roast for 35 – 45 minutes. In a stockpot over medium low heat, sauté the onions, celery and garlic with 2 tablespoons of olive oil, the butter, and red pepper flakes for 5 minutes, until the onions soften a bit. Add bay leaf, basil, thyme, and chicken stock. 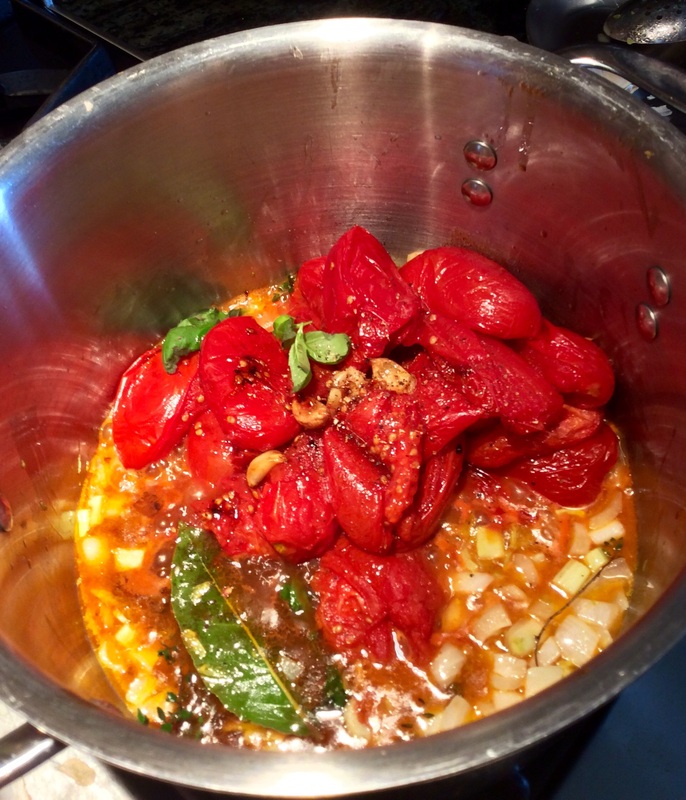 Add the oven-roasted tomatoes, including the liquid on the baking sheet. Finally toss in the canned tomatoes. Bring to a boil and simmer uncovered for 45-50 minutes. I used a stick blender to break up the tomatoes before passing them through a food mill to remove any seeds or bits of tomatoes skins. Taste for seasonings and add the paprika. Serve hot or cold. Some may choose to add a bit of heavy cream for more of a “Campbell’s soup” experience. Garnish with grilled crostini with melted parmesan and since I had some olive oil leftover from crispy fried peppers, I put just a touch in my bowl. I also like olive tapenade crostini for a change.